Alan Mahar founded TSFG in 1983, clocking up twenty years before becoming an honorary member. He was from 1998 until 2012 Publishing Director of Tindal Street Press, Birmingham’s fiction publisher, which boasted prize-listings for the Man Booker, Costa, Orange and Commonwealth Writers Prizes. He is the author of two novels, Flight Patterns (Gollancz, 1999) and After the Man Before (Methuen, 2002). Other publications include short stories, reviews and articles for Critical Quarterly, Literary Review, London Magazine, Warwick Review and the Observer. He is now a freelance consultant editor, writer and creative writing lecturer. Gaynor Arnold was born in Wales but has lived and worked in Birmingham for forty years. Her first novel, Girl in a Blue Dress (Tindal Street Press), was long-listed for the Man Booker Prize 2008 and the Orange Prize 2009, and has been sold and translated all over the world. In 2011 she published a collection of short stories, Lying Together, and in 2012 a second novel, After Such Kindness, inspired by Lewis Carroll’s relationship with Alice Liddell. She has been a member of Tindal Street Fiction Group since 1988. Alan Beard has had two collections of stories published: Taking Doreen Out of the Sky (Picador, 1999) and You Don’t Have to Say (Tindal Street Press, 2010). He also edited Going the Distance (TSP, 2003), an anthology celebrating 20 years of TSFG. Alan won the Tom Gallon Award 1989, and was longlisted for the Edge Hill Prize 2011. He has had stories published in many magazines and anthologies including Best Short Stories 1991 and Best British Short Stories 2011. He has been a member of TSFG since 1985. Kavita Bhanot grew up in London and lived for many years in Birmingham before moving to Delhi to direct an Indian-British literary festival and then work as an editor for India’s first literary agency. Kavita is currently a PhD student at Manchester University, and has Masters in Creative Writing and in Colonial and Post-colonial Literature, from Warwick University. She has had several stories published in anthologies and magazines, two of her stories have been broadcast on BBC Radio 4, and she is the editor of the short story collection Too Asian, Not Asian Enough (Tindal Street Press, 2011). She is a reader with The Literary Consultancy. Julia Bell is a writer and academic. She works at Birkbeck in Central London teaching on the MA in Creative Writing. She is the author of two novels for Young Adults – Massive and Dirty Work – both published in the UK by Macmillan and is the editor of the bestselling Creative Writing Coursebook which she wrote while teaching at UEA. She is the founder and director of the Writers Hub website and she is currently working on several new projects including a memoir in verse called Hymnal and a new novel for Young Adults. She has been a member of Tindal Street Fiction Group since 1992. Luke Brown was born in 1979 and grew up in Fleetwood, Lancashire. He spent fifteen years in Birmingham and now lives in London. He has worked as a publisher of fiction for over a decade. His short fiction has been published in various journals and anthologies and his debut novel My Biggest Lie is published by Canongate in April 2014. Georgina Bruce was born in Birmingham and has lived in Japan, Turkey, Morocco and Egypt. She now lives in Edinburgh, where she works as a teacher and moonlights as a typist to make ends meet. Her previous jobs have included cleaning, bellydancing and teaching creative writing. Her short fiction has been published in various magazines and anthologies, and she is currently working on her first novel. Her blog, Monster Soup, can be found at www.georginabruce.com. Ryan Davis’s debut novel, 27, is published by Sidewinder Books. He has a background in the music industry, setting up IKS Records in 2003, and with his own band, Adventure Club, releasing an album, Wilderness Music on Re-Action Records in 2007. He has an MA from the National Academy of Writing, where he was awarded the 2011 screenwriting prize for The Box of Secrets. Ryan’s short story, ‘The Conversation’, appears in the anthology, Finding a Voice. He writes about books, film and music on his blog, Lost in Language City. 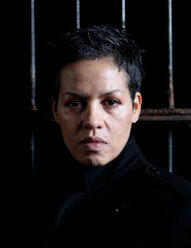 Kit de Waal was born in Moseley, Birmingham, one of five children of an Irish mother and Caribbean father. She has an MA in Creative Writing, is a Trustee of Prisoners Abroad and of The Inheritance Project, and writes training manuals on children in care and judicial studies. She has had stories published in The Fish Anthology and by Black & Blue Writing. She is an associate member of Tindal Street Fiction Group and of Moseley WRB Writers. Anthony Ferner is a professor of international business at De Montfort University, Leicester, and has published widely on his academic research. The story in this anthology is his first published work of fiction. He also has two novels nearing completion. He is grateful for the encouragement of Tindal Street Fiction Group, without which it’s unlikely he’d have written a short story in the first place. Anthony has been a member of Tindal Street Fiction Group since 2010. Jackie Gay is a writer and professional sailor and she never thought she’d be able to say that! She was born in Birmingham and has published two novels with TSP, as well as co-editing three collections of short fiction. She taught creative writing at Birmingham City University and the National Academy of Writing before moving to the west coast of Canada to get married. She still teaches online and is currently writing a historical biography, a memoir and proudly wearing a maple leaf as a member of the Canadian Sailing Team. Roz Goddard co-ordinates the West Midlands Readers’ Network and works extensively as a writer in educational settings. Recent work has included a series of poems for The Herbert Gallery in Coventry linked to the work of painter George Shaw and her poetry is on permanent display in Birmingham Museum and Art Gallery. Her poetry has featured on BBC R3 and 4. She was recently awarded an Arts Council writer’s bursary to work on her next collection of poems. She sits on the Board of Writing West Midlands. Her most recent collection of poems is: The Sopranos Sonnets and Other Poems, pub Nine Arches Press. James B. Goodwin was raised in Coventry. He left school at fifteen and went to work in local factories. After twenty-two years on the shop floor and having taken A-levels at evening classes, he took an English degree at Warwick University. He moved to Birmingham in 1978 and joined Tindal Street Fiction Group in 2006. His first novel, Bad Seed, was published in 2013, and his second, Power Cut, will be published later in the same year. Fiona Joseph is a writer of short stories, graded readers and narrative non-fiction. Her latest book, BEATRICE – The Cadbury Heiress Who Gave Away Her Fortune, was published through her own imprint, Foxwell Press, and was long-listed in the 2012 International Rubery Book Award. Fiona lives in Birmingham and is an associate member of Tindal Street Fiction Group. Author photo: David Travis. Joel Lane lives in Birmingham and works as a journalist. His fiction touches on the genres of supernatural horror and crime, with published work including two novels, From Blue to Black and The Blue Mask; four collections of short stories, The Earth Wire, The Lost District, The Terrible Changes and Where Furnaces Burn; a booklet of crime stories, Do Not Pass Go; and three book-length collections, plus a pamphlet, of poems. He and fellow TSFG member Steve Bishop jointly edited the crime anthology Birmingham Noir. Annie Murray has had stories published in London Magazine, SHE, Pretext (UEA) and in Tindal Street Press anthologies Her Majesty and Going the Distance. She has had eighteen historical novels published by Pan Macmillan, including Chocolate Girls and My Daughter, My Mother. She is an associate member of Tindal Street Fiction Group and is currently studying for an MA in Creative Writing at Oxford Brookes University. She lives in Reading. Mez Packer’s stories and articles have been published in Under the Radar and Mslexia and on the Writers Hub. She has written two novels, both published by Tindal Street Press. Among Thieves (2009) was nominated for the Commonwealth Writers Prize and the Authors Club First Novel Award. The Game is Altered was published in 2012. Mez is an associate senior lecturer at Coventry University and lives in Leamington Spa with her husband and daughter. Photo: T. Armitage. Sibyl Ruth is a poet who has increasingly been lured into writing prose. Her poetry collections are Nothing Personal (Iron Press, 1995) and I Could Become That Woman (Five Leaves, 2003). In 2008 she won the Mslexia Poetry Competition. The last short story she published was in the long-defunct magazine Spare Rib. Sibyl has worked in advice centres and arts organisations, but now earns a (very) precarious living by juggling writing with freelance literature work. She lives in South Birmingham. Amanda Smyth is Irish-Trinidadian and was educated in England. Her first novel, Black Rock (Serpent’s Tail), won the Prix du Premier Roman Etranger 2010, and was selected for Waterstones New Voices in 2009. It was also chosen for Oprah’s Summer Reads 2009. A Kind of Eden, Amanda’s second novel, was published in July 2013. Amanda has been a member of Tindal Street Fiction Group for seven years. Natalie White was born in Birmingham, and is now a Secondary School English teacher. She has been a member of Tindal Street Fiction Group for three years, writes short stories and is writing her second novel. She lives in Shropshire where she leads a writing group and enjoys running, cycling and swimming. This is her second published short story. Natalie has been a member of Tindal Street Fiction Group since 2010. Charles Wilkinson was born in Birmingham in 1950. His publications include The Snowman and Other Poems (Iron Press, 1978) and The Pain Tree and Other Stories (London Magazine Editions, 2000). His work has appeared in Best Short Stories 1990 (Heinemann), Best English Short Stories 2 (Norton), Midwinter Mysteries (Little, Brown), The Unthology (Unthank Books), London Magazine, Supernatural Tales and Theaker’s Quarterly Fiction. A pamphlet of his poems is forthcoming from Flarestack. Polly Wright is a writer, lecturer, and occasional performer. Five of her plays have been staged professionally and four of her short stories have been published, including two in a showcase anthology, Are You She? She is the artistic director of The Hearth Centre, which harnesses the transformative strength of the arts to raise awareness about health issues and is currently in partnership with the Birmingham Rep and the Birmingham and Solihull Mental Health NHS Trusts. Seagulls in Sparkhill was developed from ideas which emerged from creative writing work in a mental health setting.